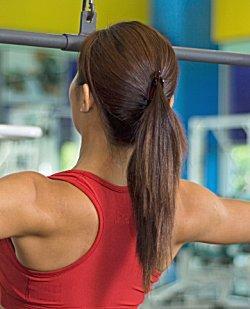 Ponytails easily keep hair out of the way during exercise or other activities. Ponytails are classic, easy hair styles that suit any number of activities and personalities. But while many people think of these quick styles as just a casual look, they can actually serve many purposes and work as a starting point to more elaborate styles. The "messy" look that seems thrown together but stylishly blends with an active, fun lifestyle. Sideways styles for a flirty look. Dual tails that are particularly popular with children. Partial tails that keep hair out of the way without full constraints. Other hair styles begin with basic tails that are then elegantly styled for more elaborate looks, such as many updos and braids. To begin a tailed style, start by pulling hair back into a simple elastic band (choose tangle-free bands for fewer painful tugs), pulled tight to the head. Depending on the style, the band may be positioned low (at the nape of the neck), high (at the highest point on the back of the head), or off-center (usually for crazy styles or updos). Dual tails are an easy and efficient kids' hair style. Ponytails are a versatile style for nearly any face shape, age, or hair type. Naturally they are not good choices for individuals with short hair, and layers may also be difficult to contain in a tail without using hair spray or other control products. Bangs can help frame a face even when the rest of the hair is pulled back, and the style also highlights earrings and other fashion accessories as well as keeping hair under control during vigorous activities. Long and medium hair lengths work best for tails, and they are popular with men, women, and teens. 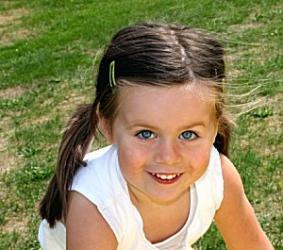 Tails are also great options for young girls' formal styles, such as flower girl hair styles. A simple tail may use just a plain band or wrap, but there are many accessories that can liven up this simple style. Elaborate scrunchies, claws, and cloth bands add a splash of color and style to the look, while hair pins and other jeweled accouterments can make it a beautiful formal style. Many people even accessorize tails with small braids or colorfully wrapped strands that are drawn back into the style. For individuals with short hair, ponytails are not inaccessible. Many clip on hair extensions are available in different tail styles, from flirty and curly to sleek, smooth looks in a wide range of colors and lengths. This allows everyone, no matter what their hair length, to enjoy a fun tailed style. Despite the style's deceptively simple nature, certain precautions are necessary both to protect the look and the hair. If your hair tangles easily, consider using a leave-in conditioner to prevent painful snarls from the restraining band. Because the hair on the top of the head is not free to move in a tailed style, sun protectant may be necessary to prevent heat damage. Too-tight ponytails can cause pain, redness, and even hair loss, so be sure to choose a comfortable yet secure style. Named for a pony's sleek, long tail, ponytail hair styles are fun, easy, and versatile. Whether you are looking for a quick casual look or a formal yet carefree style, there is a tailed style for you.